Diego is made from a tan coloured material with embroidered brown eyes and an embroidered mouth and nose. He has fuzzy brown hair and wears a white shirt covered in blue vertical stripes with the Chicago Cubs logo on his chest and blue shorts. Diego is based on the character from the Dora the Explorer spin-off, Go Diego Go! 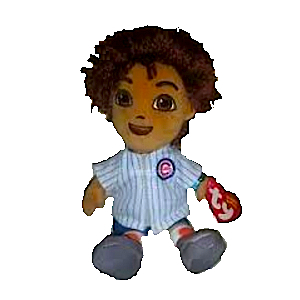 This version was a Chicago Cubs exclusive Beanie Baby and wears the Chicago Cubs outfit.